One of the hardest parts of writing a book isn’t always choosing what to put in; it’s choosing what to leave out. So, when I wrote Ask Me Anything, Lord, I had to choose which questions God asked in Scripture that I would include in the book and which ones I couldn’t. That was tough. In the end, I trusted God to lead me and even had to cut out some of my very favorite questions in favor of others I felt He wanted me to cover. But now, I’d like to share some of the other questions with you in a series on the blog: Ask Me More. And, if these questions intrigue you, please check out my book, Ask Me Anything, Lord: Opening Our Lives to God’s Questions for a deeper study on how we can let God search our hearts with the very questions He asked others in the Bible. Anger transforms my blond beauty into a furious mess. Her face burns red hot and tears sting her eyes and cheeks. Her long hair escapes hair clips and ponytail holders and frizzes out all wild and untamed. She stomps around as if her feet alone weigh 50 pounds each and her whole body closes in—her fists clenched, her arms crossed, her chin buried into her chest. It’s her sense of justice that typically sends her into a fit. And I’m going to fight to prove it. She gets that from her dad. It’s one of the reasons I fell in love with him. And, normally it’s the beauty in her, too: this absolute willingness to defend justice and truth no matter what it takes or costs. One day maybe she’ll advocate for orphans and for the oppressed and she’ll be a mighty force on their behalf. But sometimes, she doesn’t see the whole picture. She is, after all, only eight years old, and when you’re eight, you don’t know as much as you think you know. That’s why she assumes a fighting stance when her four-year-old sister munches on an ice cream sandwich. How come she gets a treat? That’s not fair! I talk my crusader down off the ledge and remind her that she hadn’t even asked. Why get angry when my answer would be yes? And why rage over whether or not I punish her younger sister often enough? It must be that she doesn’t trust me as a mom to discipline well, to show grace when needed, and to teach my children what is right. I understand. Don’t I sometimes rage myself over my own causes? Lord, why are you blessing them and I’m struggling? I’m the one trying to be obedient and live the righteous life and they aren’t following you at all. That’s just not fair! Lord, did you see what they did to me? Did you see how cruel and unfair, how they slandered and lied and spread the muck to others? Can’t you strike them with lightning or something? Anger isn’t wrong in itself. We can fight with that same righteous indignation of Jesus cleansing the temple grounds of con men and scam artists. But sometimes what we claim is righteous indignation really is not trusting God to see truth, to defend us, to care for us, to show mercy when mercy is needed and justice in its time. That was the prophet Jonah, sitting on the outskirts of Nineveh in a foul mood all because God showed mercy to an entire nation when they repented following Jonah’s hellfire and brimstone proclamation. This change of plans greatly upset Jonah, and he became very angry. So he complained to the Lord about it: “Didn’t I say before I left home that you would do this, Lord? That is why I ran away to Tarshish! 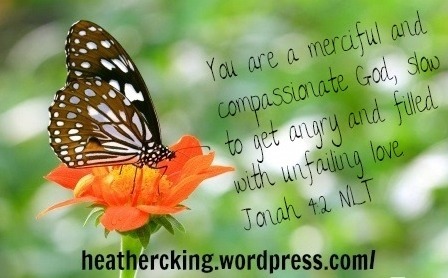 I knew that you are a merciful and compassionate God, slow to get angry and filled with unfailing love. You are eager to turn back from destroying people. Just kill me now, Lord! I’d rather be dead than alive if what I predicted will not happen’ (Jonah 4:1-3). He raged about God’s character, spitting out the words that should be worship as angry accusations instead: I knew it. You’re merciful, compassionate, slowly angered, abounding in love. God could have defended Himself. He could have given Jonah his wish and killed the frustrated prophet on the spot. Instead, he used a question to dig out the mess of unforgiveness in Jonah’s heart and reveal God’s own character of compassion for the lost. It did seem right and just. Nineveh was the enemy of God’s people! They had destroyed Jonah’s friends and family! Surely they deserved revenge, not grace! But God didn’t let the prophet linger there in hatred. He caused a plant to grow overnight to shade Jonah’s hot head (in more ways than one!). Then, when Jonah rejoiced over that plant, feeling somehow that he deserved God’s favor and blessing, God sent a worm to chomp that plant right down to nothing. God pressed in, challenging how Jonah cared more for a plant than for a nation of 120,000 lost people. He shifted Jonah’s perspective and He urged Jonah to trust Him. That’s what’s at stake for us, as well. When we’re angry, can we still trust? When anger seems justified, can we still lay our right to rage down at God’s feet and leave it all in His hands? And as we do, we worship: You are merciful, compassionate, slow-to-anger, full of unfailing love. Yes, Amen, Lord. Your will be done even in this.